We here at OBP take pride in our sports teams, and we proudly adorn the colors of those teams. However, not everyone is able to afford that same luxury. When this company started in 2010, the message was clear; we wanted to make clothing that inspires unity in our community. For the last three seasons, we have tried to paint the town orange, black and purple. So far, we have been wildly successful. Thousands of people, from Dundalk to Australia, have helped us pack the stadiums and provide our teams with the ultimate home field advantage. Regardless of which holiday you celebrate, this time of year is all about the giving of gifts. As much as people enjoy receiving gifts, there is no greater feeling than giving a gift that someone else will appreciate. This year, the OBP guys are collecting clothing for the St. Vincent De Paul Society of Baltimore. On December 19, 2013, anytime between 12 and 10pm, come to Bill Bateman’s Bistro in Towson, and bring your new and gently worn local sports team apparel (including but not limited to jerseys, hats, t-shirts, coats,, sweatshirts and shorts). Show our flyer to your server, and Bateman’s will donate 10% of your check to our campaign. In addition to the clothing drive, we will also be hosting a silent auction, with the proceeds going to the Weinberg Housing and Resource Center. If you are unable to attend our event, and still wish to make a donation, please contact Sal Rinaudo. 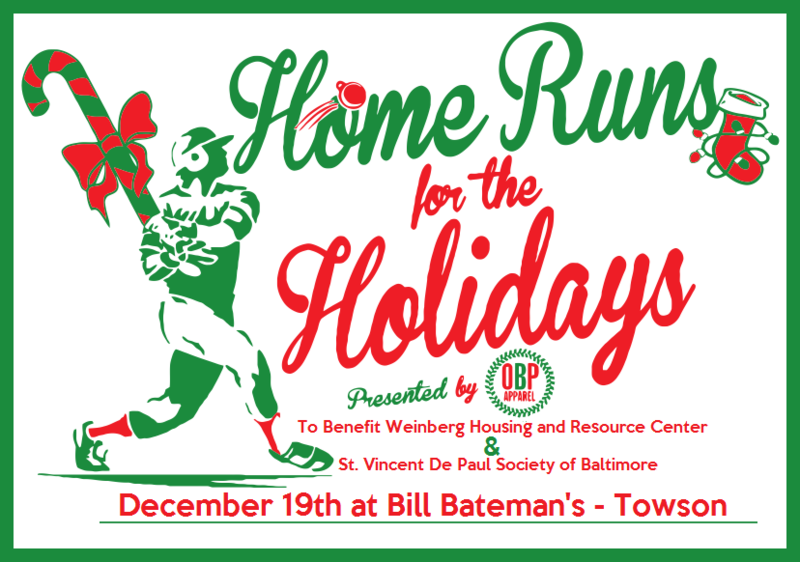 Also, OBP Apparel will be selling a “Home Runs for the Holidays” t-shirt on the website through the end of the calendar year, with 100% of the proceeds going to the Weinberg Center. For any additional information, please contact Sal here.